Orizuru Osen (The Downfall Of Osen) was directed by Kenji Mizoguchi in 1935. It’s a remarkable film from his early, silent career (Japan still produced silent film at the mid 30’s), that tells the story of Damen Osen, a prostitute who falls in-love with Sokichi, a young student of medicine. 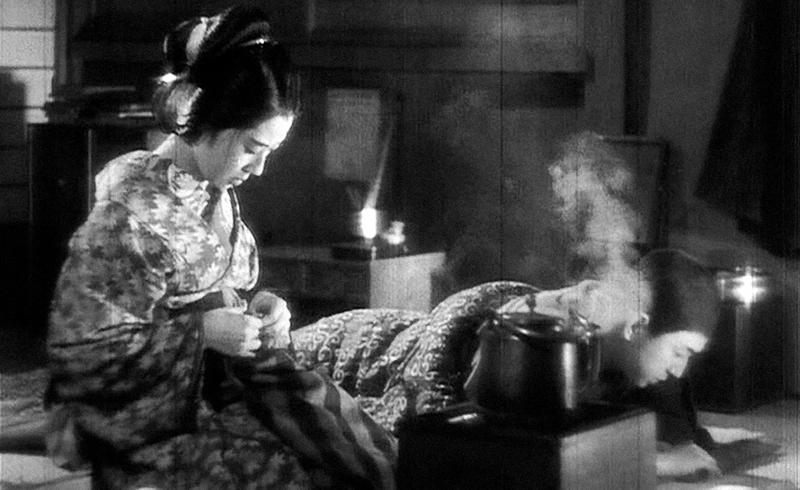 Mizoguchi tells this sad story about the miserable life of two poor souls in flashbacks and with elegant camera movements that are so characteristic of his early period. The film portrays a sense of the futility of life, yet thanks to Mizoguchi’s visual poetry this human tragedy has a bizarre, sad beauty that is difficult to grasp. Music by Carolina Cortés Zambelli (voice), Nathalia Valdés Vergara (voice) and Renán Zelada Cisneros (violin and piano). More than making an accompaniment to the film, the music for Orizuru Osen is a kind of concept album, where each track corresponds to the psychology of a particular scene of the movie, rather than directly commenting on the action. The music not only refers to the emotions conveyed in the film, but also reflects on the medium itself and on the idea of a time gone by. Long, evocative background drones are coupled with heavily minimalistic ostinati and endless melodies, which give a feeling of timelessness, or of frozen time. Nathalia Valdés Vergara initiated her professional path in theatre, portraying several roles in plays and musicals, like: "The Merchant of Venice", "La Pérgola de las Flores", "La Remolienda", "Diario de Naranjas", among others; working with independent theatre's companies in Santiago de Chile. Since 2012, she has also worked as Assistant Direction in Opera Productions of Teatro Municipal de las Condes,like: “Le convenienze ed inconvenienze teatrali”, “Così fan tutte” and “Madame Butterfly”. She has also appeared in acting roles in opera productions of Teatro Municipal de Santiago, like: “L’elisire d’amore” and “Katia Kavanova”. Her work in Europe include the acting coach of “Dido & Eneas” at the Conservatorium van Amsterdam (2014, The Netherlands) and her acting debut as the principal actress in ‘Le Bal Masqué’ in a stage version of Poulenc’s bass cantata for the Summer National Youth Orchestra Festival (NJO 2015, The Netherlands). In 2014, she started her professional singing studies with María Soledad Díaz (Santiago, Chile) and continuing with Marcela de Loa (Freiburg, Germany). Carolina Cortés Zambelli is an Italian-Chilean video-maker who has been based in the Netherlands since 2016. After receiving her Bachelor’s degree in music composition and film directing from the Catholic University of Chile in 2013, she set up her own film & music company called “12Tonos”. Renán Zelada Cisneros graduated from the Bachelor in Music Composition program at the Royal Conservatoire in The Hague. He has participated in workshops such as the Young Composers’ Workshop at the International Organ Festival in Haarlem, and the Dutch Impro Academy. His music has been performed in the Netherlands, Germany, the US, and Chile. Currently, he is following a Master’s degree in Composing for Film at the Amsterdam Conservatoire. Sounds of Silence Festival exposes the profound art of silent film and explores its interaction with contemporary music and art. The festival will celebrate its 5th edition on March 7-10, 2019.